The trip in its entirety was fantastic. Traveling abroad was such an amazing experience that expanded my mind, my language skills and my respect for other cultures. I made friends there that I will stay in contact with for a very long time. Some of my best friends now are people I had the pleasure of meeting in Costa Rica. Before I left, I was terrified of being unable to bond with the people I was with. I have not had an easy time in the past in making friends and was fearful that my past record would continue. I could not have been more wrong. The people I met through the program were so incredibly accepting and they too wanted to make strong friendships during our time together. From bus rides together while taking turns playing music for each other, to sharing a fresh coconut on the beach, we spent every day finding new ways in which we connected, creating stronger and stronger bonds. I learned that I work well with independence. I had never traveled on my own before or been to another country in my entire life. This experience was a huge step for me on more than two fronts and allowed me to grow up. 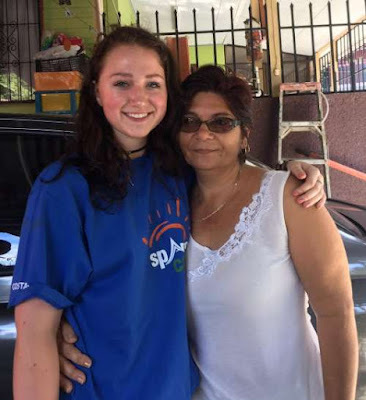 I made sure that I was prepared for every situation—keeping a small first aid kit, aloe vera, sunscreen, extra clothing, sunglasses, a hat and so much more in my bag, I was able to assist everyone at one point or another when they were in need. (Just a pointer, there is no such thing as too much sunscreen! I saw some bad burns I had to save with my aloe vera.) I was camp mom. I found out that I love taking care of people and making them feel taken care of. 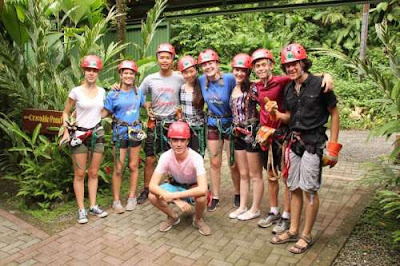 Doing the homestay program really helped me immerse myself into Costa Rican culture! The family I stayed with in San Jose consisted of a mom, dad brother and sister, who all welcomed me with open arms. They were very patient with me while I communicated with them in a mix of Spanish and charades, and helped me out when I was struggling with my vocabulary and grammar. The environment of the house was quaint in the mornings and lively in the evenings. The first night I stayed with my family, it was my host sisters 18th birthday party. Around 30 people came and were dancing, eating, chatting and partying it up! I talked with a bunch of people that night and they made me feel so welcomed and comfortable, and by the end of the evening I was singing karaoke to Spanish songs in front of everyone. It was an amazing experience and one of many that I would have with them. I also stayed with a woman in Quepos near Manuel Antonio. She was a wonderful cook and incredibly kind and funny. We carried conversations easily and when there was a language barrier, we simply pulled out a Spanish-to-English dictionary and found our way around it. She even taught me how to cook Arroz con Pollo and Gallo Pinto. Some evenings we would walk around the town and go to the water front and get gelato and chat about the differences between the states and Costa Rica. I am so glad that I did the homestay program and would definitely recommend it to anyone who wants to drastically improve their language skills and learn more about a different culture. What I learned during the trip was that I am capable of more than I expected of myself. I was able to communicate in a new language, partake in new cultural activities and immerse myself into the opportunity that was provided to me. I asked questions when I was confused, answered questions when I could, participated in activities I was unsure of (finding out that they were awesome), and made sure that I had the best and most full experience I possibly could have. I believe I did and I am incredibly grateful for everyone that made this possible for me.